Investors who are looking to purchase a new property often look at buying off-the plan, says BMT Tax Depreciation. Buying off-the-plan essentially means you are entering into a contract to purchase a property prior to, or during the construction phase of a property or a development. One big benefit of purchasing off-the-plan that investors often fail to consider is the property depreciation benefits available. There are significant depreciation deductions available to the owner of a property purchased off-the-plan. It is important to note however that the property must be completed and be generating an income to claim depreciation deductions. A completed property purchased off-the-plan will typically attract between $8,000 and $14,000 in depreciation deductions in the first full financial year, so it is fair to say that the new owner can make significant savings and increase their available cash flow by claiming depreciation for the property once it is income producing. Newly built properties constructed off-the-plan will contain new fixtures and fittings*. Therefore, the depreciable value of these items will be higher. The owners are also eligible to claim the maximum capital works deductions for the building structure, which means more deductions are available to claim over the life of the property (forty years). Visit BMT Tax Depreciation website. When it comes to the fixtures and fittings in an off-the-plan property, investors should be aware that not all assets are created equal. In most cases, those assets with a higher starting cost will generate higher depreciation deductions. For this reason, investors may want to consider the brand and price range of assets in an off-the-plan property. 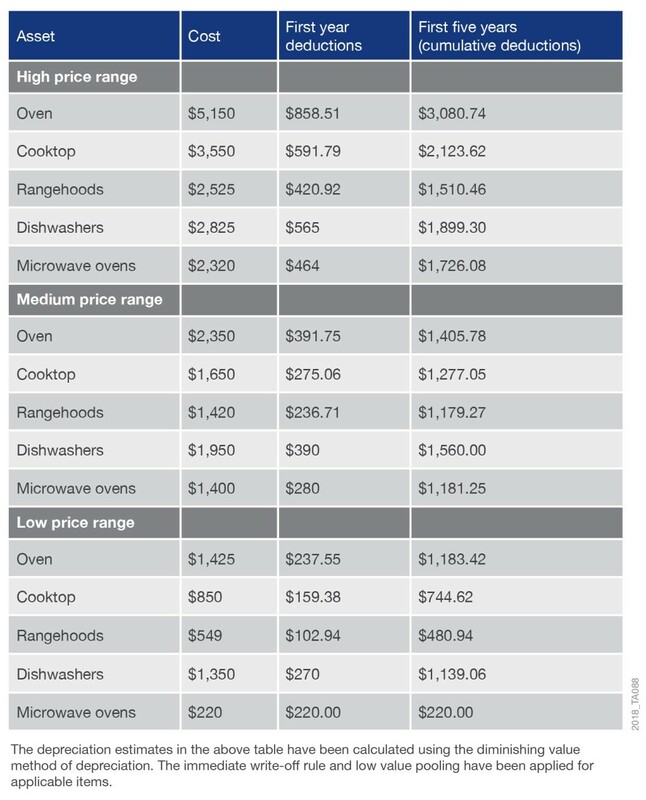 Focusing on a kitchen in an off-the-plan property, the below table illustrates how the depreciation deductions available will vary depending on the model or price range. Image supplied by BMT Tax Depreciation. As you can see, those assets with a higher starting cost generate higher deductions than those with a lower base cost, both in the first full financial year and over the first five years combined. As one example, a high range oven costing $5,150 will receive $858.51 in first-year deductions and $3,080.74 in the first five years, while a low range oven purchased for $1,425 will get $237.55 in first-year deductions and $1,183.42 over the first five years. This is a difference of $1,897.32 in the first five years. If this is the difference an investor can see from just one asset, it’s understandable why they would want to give due thought to all the plant and equipment assets installed, as they add up to substantial depreciation differences. Please note that the low-range microwave oven purchased for $220 would receive a 100 per cent write-off in the first year. It is recommended that investors consult with their Accountant to seek advice when purchasing a property off-the-plan and also speak with a reputable Quantity Surveyor to get an estimate of the likely depreciation deductions available for the property. Read more about depreciation legislation changes on the BMT Tax Depreciation website. A specialist Quantity Surveyor such as BMT Tax Depreciation will liaise with the Property Developer to request information about the property. This information is used to provide a detailed estimate of the depreciation deductions that will become available once the property has been completed and is income producing. By obtaining this information, the owner will have a far more comprehensive idea of the end cost involved in holding the property. The additional cash flow created from a depreciation claim can be put towards future loan repayments or to help save for future investment property purchases. * Under new legislation outlined in the Treasury Laws Amendment (Housing Tax Integrity) Bill 2017 passed by Parliament on 15th November 2017, investors who exchange contracts on a second-hand residential property after 7:30 pm on 9th May 2017 will no longer be able to claim depreciation on previously used plant and equipment assets. Investors can claim deductions on plant and equipment assets they purchase and directly incur the expense for. Investors who purchased prior to this date and those who purchase a brand new property will still be able to claim depreciation as they were previously. To learn more about depreciation rules or to read BMT's comprehensive White Paper document visit the BMT Tax Depreciation website. Article provided by BMT Tax Depreciation. This is a sponsored post. Which depreciation method is best for you? Visit the BMT Tax Depreciation website.